Online application for Admission into the Govt. 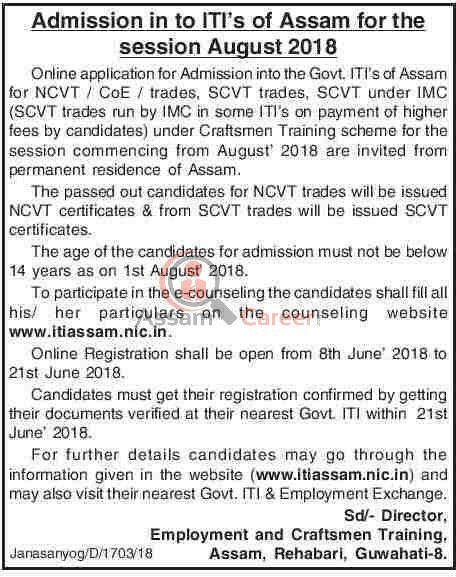 ITI's of Assam for NCVT / CoE / trades, SCVT trades, SCVT under IMC (SCVT trades run by IMC in some ITI's on payment of higher fees by candidates) under Craftsmen Training scheme for the session commencing from August' 2018 are invited from permanent residence of Assam. The passed out candidates for NCVT trades will be issued NCVT certificates & from SCVT trades will be issued SCVT certificates. Age: The age of the candidates for admission must not be below 14 years as on 1st August' 2018. Educational Qualification: Passed 10th class under 10+2 system of education with science & mathematics or its equivalent. How to apply: To participate in the e-counseling the candidates shall fill all his/ her particulars on the counseling website www.itiassam.nic.in. Online Registration shall be open from 8th June' 2018, to 21st 23rd June 2018. Candidates must get their registration confirmed by getting their documents verified at their nearest Govt ITI within 21st June 2018. For further details candidates may go through the information given in the website (www.itiassam.nic.in) and may also visit their nearest Govt. RA & Employment Exchange. 1. 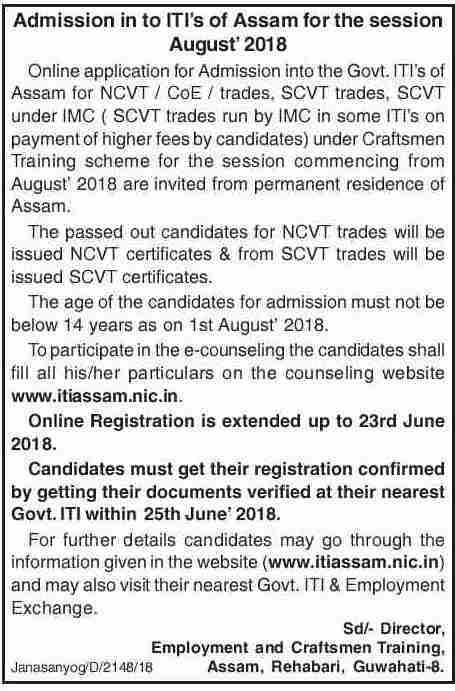 To participate in the e counselling the candidate shall fill all his particulars on the counseling website www.itiassam.nic.in under the option New Registration. 2. After filling all the correct information, the candidate will take the printout of his filled particulars. The candidate has to remember password filled during registration. 3. To correct information (if any), the candidate has to login by using Roll no printed on the printout and password. For correction the candidate will use edit Registration Module. 4. After taking the printout, candidate shall have to visit the nearest Govt. ITI for verification of his documents with the particulars filled during registration, as per scheduled dates on all working days during office hours. 5. The candidates who have applied for the trade for entry qualification of class VIII pass trades shall produce the certificate in format-I along with mark sheet, while verification of their documents. 6. For 10th pass entry qualification they will produce HSLC pass documents & mark sheets at the time of verification. 7. The candidates of CBSE courses are to fill their marks of each subject by converting from CGPA (multiplying by 9.5). 8. No grade is allowed to put in marks table. 9. The candidate will be eligible for filling his choices only after verification by the Govt. ITI. 10. The registration is one time process & it will be valid throughout the online counselling. 11. The candidate will then check his/her rank (Merit position) on his page, when announced in the portal. a. Edit Registration: In case a candidate has entered any information by mistake, he can edit his entered information by “Edit Registration” option, before verification. b. Available Choices: The candidate will be provided with list of institutes & courses (NCVT, SCVT and SCVT under IMC on payment of higher course fee) separately. c. Fill Choices: The candidate can fill the institute & courses of his choice provided in the list in order of preference. d. Display filled Choices: Choices entered by the candidate will be displayed on different format so that the candidate can check the already entered information. e. Change Password: Candidate can Change his/her password using the option. f. Allotment letter: Candidate can generate allotment letter before reporting for admission to an allotted institute. 13. The candidate has to fill his choices & save his choice within the stipulated time period as declared by the DE&CT Assam in counselling schedule. 14. Allotment of seat: After the choice filling is over, all filled choices of all registered candidates will be considered for allotment of seats as per merit (Rank) & category of the candidate. The allotment of seat is purely provisional. 15. If a seat is allotted, the candidate has to take printout of his allotment letter & visit the allotted Govt. ITI for accepting the admission. 16. If no seat is allotted, then the candidate has to participate in the next counselling by filling his choices again. 17. If a candidate is allotted a seat and doesn’t take admission, then his candidature will be forfeited for the entire admission process. automatically cancelled. In that case the candidate’s admission fees will be refunded after completion of the whole admission process. 19. The detailed instruction about the online counselling is available in the website. Advertisement Details: Pl check here and here and here and here.and here .